The Pecos Headwaters Watershed, Cow Creek (Pecos River to Bull Creek) are designated for temperature impairment. 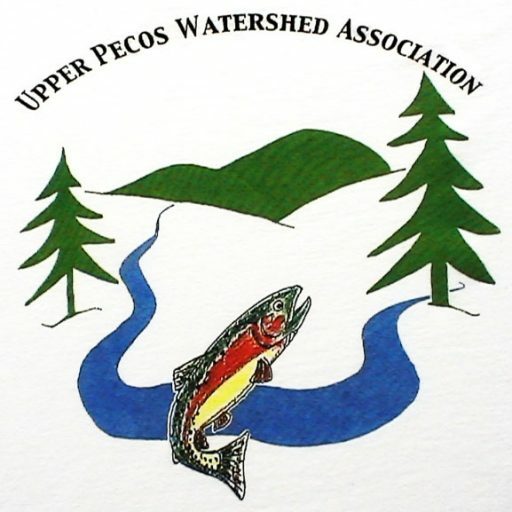 The 2016-2018 Clean Water Act Section §303(d)/§305(b) Integrated Report recognizes three stream segments in the upper Pecos watershed as being impaired for temperature (Table 1) with the probable sources of impairment including: highway/road/bridge runoff (non-construction related), loss of riparian habitat, range land grazing, stream bank modifications/destabilization, and watershed runoff following forest fire. Designated uses of perennial reaches of Cow Creek and all perennial reaches of its tributaries and the main stem of the Pecos river from Cañon de Manzanita upstream to its headwaters include: domestic water supply, fish culture, high quality cold water aquatic life, irrigation, livestock watering, wildlife habitat and primary contact; and public water supply on the main stem of the Pecos River of the Upper Pecos Watershed Based Plan cited above provides more information on the water quality problem for the lower reach of Cow Creek. For the Cow Creek (Pecos River to Bull Creek) Assessment Unit, the water quality standard for temperature is achieved when the percent total shade is increased to 61 percent, although the actual Load Allocation (which includes a margin of safety) of 73.0 j/m2/s is achieved when shade is further increased to 65 percent. This project proposes to implement restoration on a segment that comprises 7 percent of the total reach length. Thus, our goal for this project is to increase canopy cover along a 0.75-mile long segment of Cow Creek (Pecos River to Bull Creek) by 8 percent and to produce an estimated reduction in temperature of 0.07 ⁰C by 2020. In the longer term, the project is expected to produce a total canopy cover increase within the 0.75-mile segment of 25%. Future projects upstream and downstream along this lower reach of Cow Creek would eventually combine with this one to achieve the desired goal for the entire reach of a 2.5 ⁰C temperature reduction. This stated goal might not be achieved until the planted vegetation along the reach matures and develops a full canopy; however (all other factors being held constant), the Contractor anticipates some measurable progress will be made by 2020 that demonstrates a trend towards achievement of the temperature reduction goal. If the temperature modeling is correct, the anticipated increases in canopy cover and shade will certainly achieve the stated goal in water temperature reductions over a longer time frame of 10 to 15 years. Agriculture and livestock grazing have significantly affected regrowth of naturally occurring vegetation in the project area. A significant component of this project involves conducting workshops with local landowners, who support this project, to show them how they can better manage their land to reduce erosion and improve water quality in this segment of Cow Creek. Initial discussions with these landowners indicates a strong desire to better understand the interaction between their land management practices and the creek. 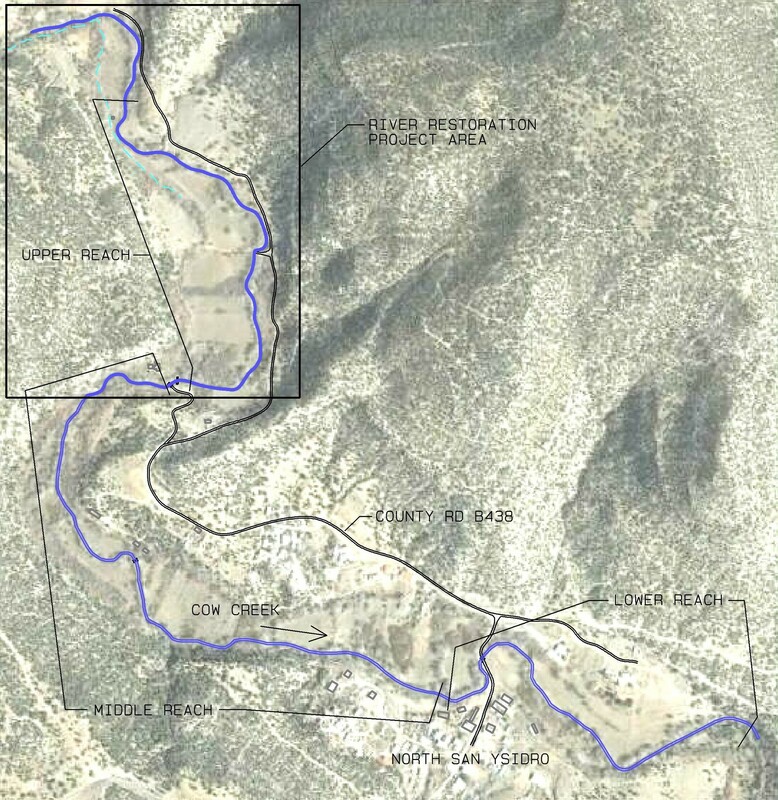 The project area is located entirely on private land along a 0.75-mile segment of the Cow Creek Assessment Unit (Pecos River to Bull Creek, NM-2214.A_090), upstream of North San Ysidro, NM, within the 12-digit Hydrologic Unit Code (HUC) number 130600010104 (Featured Image). This priority reach is near the lower end of approximately 15.57 impaired stream miles in total (2016-2018 Clean Water Act Section §303(d)/§305(b) Integrated Report). This Assessment Unit encompasses 22,253 acres in total. The project area consists of approximately 0.75 mile of Cow Creek and approximately 9 acres of land area, assuming a 100-foot corridor width where the project will be implemented (Figure 1). From a qualitative standpoint, this reach is in “good” to “fair” condition in most locations. Entrenchment to bedrock is common throughout the project area. 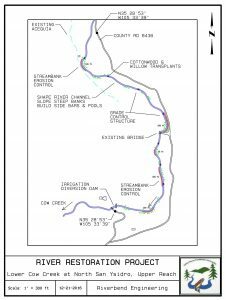 Riverbank erosion is scattered and unevenly distributed, with most occurring in the lower half of the project area. Shade over the stream is good in most places, although frequently threatened by erosion and absent in areas with the highest degrees of erosion. Heavy grazing and agricultural practices continue to plague this reach of the creek. Local landowners have taken significant measures to protect the stream bank in a number of locations, but these “fixes” have subsequently led to unanticipated consequences downstream. First, our goal is to implement and complete an on-the-ground project that achieves some measure of water-temperature load reduction in the Cow Creek Assessment Unit as described in Chapter 5 – Management Measures, Restoration Techniques (pages 52-54) of the Upper Pecos Watershed Based Plan. 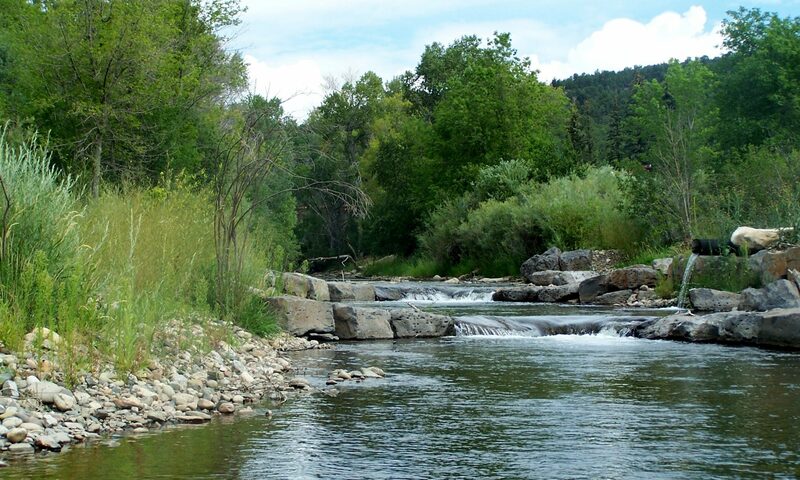 Second consideration is to implement a project that will improve riparian habitat in the near-term (within the 4-year project life) and to use the project to showcase and promote the use of similar restoration techniques to landowners along the Pecos River and Cow Creek in future public outreach and education work. Third, the Cow Creek project area is a prime example of an area where the benefits of the proposed restoration would serve as a demonstration and model for other landowners upstream and downstream within the Assessment Unit. The benefits of reducing erosion along this reach using the techniques described in the Upper Pecos WBP and employed by this project would be quickly realized by the public and contribute to meeting our goals of engaging and involving the public as described in Chapter 9 – Outreach and Community Involvement of the Upper Pecos WBP (pages 85-86). Boulton, Boulton, A. J., S. Findlay, P. Marmonier, E. H. Stanley, and H. M. Valett. 1998. The functional significance of the hyporheic zone in streams and rivers. Ann. Rev. Ecol. Syst. 29:59–81. Essig, D. 1998. The Dilemma of Applying Uniform Temperature Criteria in a Diverse Environment: An Issue Analysis. Idaho Division of Environmental Quality Water Quality Assessment and Standards Bureau, Boise, ID. 34 p.
Poole, G.C., and C.H. Berman. 2000. Pathways of Human Influence on Water Temperature Dynamics in Stream Channels. U.S. Environmental Protection Agency, Region 10. Seattle, WA. 20 p.